I found out today that mcglinch.com/blog won the first ever AussieJourno-ThatBlueYak Gold Metal 2007. The AussieJourno part is a weekly compilation of the best blogs reviewed by Aussie journalist (and fellow Mac) David McMahon. ThatBlueYak, apparently, took David’s list and chose their own favorites from that list. ThatBlueYak appears to be some sort of manufacturing concern. 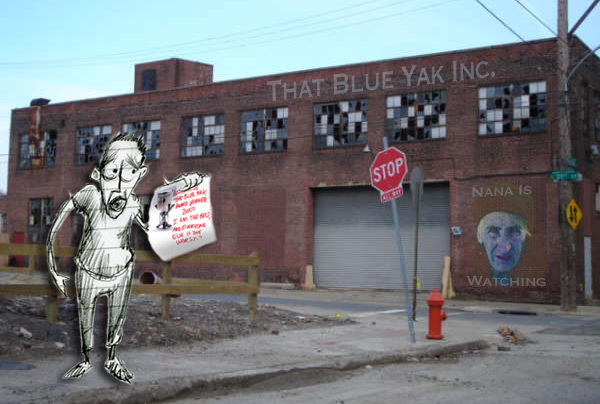 Part of winning my prize was that I render myself in front of the That Blue Yak factory with my award (see right). 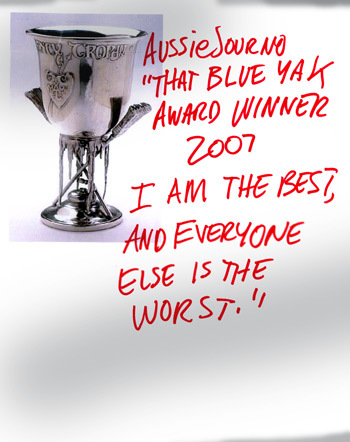 Note that I had to render my own award based That Blue Yak’s instructions. It’s all pretty confusing and if you can sort it out, let me know. This entry was posted in aussiejourno, award, doodles, media, thatblueyak. Bookmark the permalink.